After roughly a year and a half, and a bit under 100 hours of total playtime, I’ve finally finished all three campaigns of Fire Emblem Fates. There were certainly times when the game wore out its welcome and I needed to take a break, but overall it was an experience that I don’t regret. It was the game that I’d always open up on the bus or on a plane, or whenever I had a tiny pocket of time to fill with some good old Fire Emblem strategy. But I had a good time playing in casual mode. If you play Fire Emblem with permadeath on, you’re crazy. So I’ve played four Fire Emblem games so far. There was Fire Emblem Awakening and the aforementioned three campaigns of Fire Emblem Fates, being Birthright, Conquest, and Revelations. It might be much to some of you Fire Emblem veterans, but it’s a good 140 or so hours of Fire Emblem experience. I enjoy Fire Emblem, but at the current rate, they come out with a few titles per year. 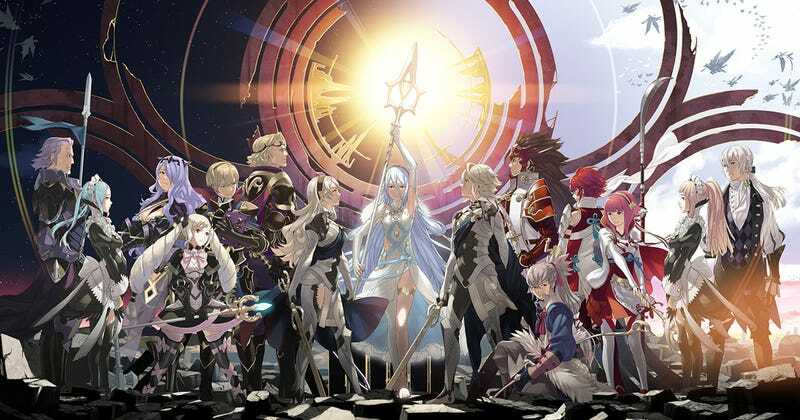 In 2016, there was of course the Fire Emblem Fates trilogy that I just finished. In 2017, we’ve already had Fire Emblem Heroes that I had to skip on due to other priorities and a general dislike of mobile phones as a gaming platform despite how good some of the games on there can be. Then there was Fire Emblem Echoes: Shadows of Valentia for 3DS, which I plan to play ASAP because wow does that game look good! And of course there’s Fire Emblem Warriors to close off the year, followed by a proper Fire Emblem installment on Switch in 2018 alongside who knows what else. So how in the hell do so many people play with permadeath?! I don’t claim to be the best at Fire Emblem. I honestly don’t even pay attention to the weapon triangle, and I often make rash decisions when I’m sure I’d be more methodical if I were playing in permadeath. But even in casual mode, it’s still a challenge. I still got Game Overs occasionally in the early chapters because I had so few units and near the end of Conquest because hot damn does it get hard! And it’s not like having a unit die is without punishment in casual mode. You can’t have that character gain any more experience if they die, and it makes the rest of the chapter a lot harder. But for some of you masochists, that doesn’t seem to be enough. You’ve just got to turn a fun game into something unmanageable. There seem to be a few ways to play Fire Emblem with permadeath on. The first is resetting the game every time a character dies. This doesn’t add any real challenge to the game; it just wastes time. Sure, the stakes are raised a bit to ideally inspire better strategy, but the punishment is making the game not fun by having to replay the exact same part again. Any punishment in a video game that makes the game not fun is too steep. Others will decide to just carry on whenever a character dies. I do not understand this. If you play like this and save over your old files, you could very easily fall into a trap where there’s no realistic way to progress because too many of your characters are dead. Each campaign of Fates approaches 40 hours! There ain’t no way in hell I’m restarting my entire game after losing some characters 20 hours in! Finally, some people, such as spikespeigel, actually pay real, hard-earned dollar bills (or pounds, pesos, yen, etc.) to beat the game with permadeath on. WHY???!!! You have the entirely free option of playing the game in casual mode, but no, you go and pay more money on top of the $40 price tag! I. Just. Don’t. Get. It. And for all of these methods, there is usually a good amount of grinding required. Sometimes it’s in-game, and sometimes you have to pay for it, but either way grinding is not fun. My general philosophy with grinding is that if it’s required for 100% completion, that’s fine, but it should never be required for getting to the credits. The funny thing is that it’s not required! Just select “casual” setting, and you’re golden! Why would you do this to yourselves?! I feel like the labeling is off. People don’t like to be called “casual,” but plenty of people are just fine with “normal.” The problem is that Fire Emblem also has a difficulty setting as well as the ability to have permadeath on or off. My proposal is that the non-permadeath setting should instead be labeled “sane,” because that’s the sane option. Of course, if you love Fire Emblem so much that you’re willing to put in the time, effort, and money, go for it! My bewilderment is caused by those, yet again, like spikespeigel (sorry for picking on you so much, man. No hard feelings!) who admit to being noobs at the series. There’s this notion that everyone should play on classic mode, and I think that’s incredibly unrealistic and unfair to new players. I’d say that if you have less than 500 hours of Fire Emblem under your belt, you probably shouldn’t be playing in classic mode. But that’s just me. Defend yourself, internet! Why do you choose to or not to play in classic mode? Type away! [EDIT] 7/25/17: Thank you for all of your comments. After reading all of them, I have come to a new understanding of why so many people enjoy permadeath in both Fire Emblem and in other games. Even though I’m a long way out from being comfortable doing it myself, I understand where you’re coming from a lot more.